I’m not sure Facebook tackles search this year, or even next. Bing’s recent roll out of “Search+ Your World” and their partnership may keep Facebook from entering the market. That’s a good article, and I’ve read it previously. Lars Rasmussen was a Google Maps engineer though. You could be right, but you don’t just enter search. Bing still hasn’t figured out how to use all mountains of social data from Facebook/Twitter to build better results than Google. The lucky thing for Facebook is that they don’t have to! Not for years. All they have to do to get started is to be better at social search – just recommendations from friends. That’s enough to get their toe in the door and build the habit of consumers searching for recommendations on Facebook. Over time, as they get better in other areas (or take advantage of their relationship with Bing), they can broaden the application to do more better. Eventually, they’ll give Google a run for general search – but not at first. http://24.media.tumblr.com/tumblr_lzsrwu25HF1r84qooo1_500. Let’s just color me skeptical. 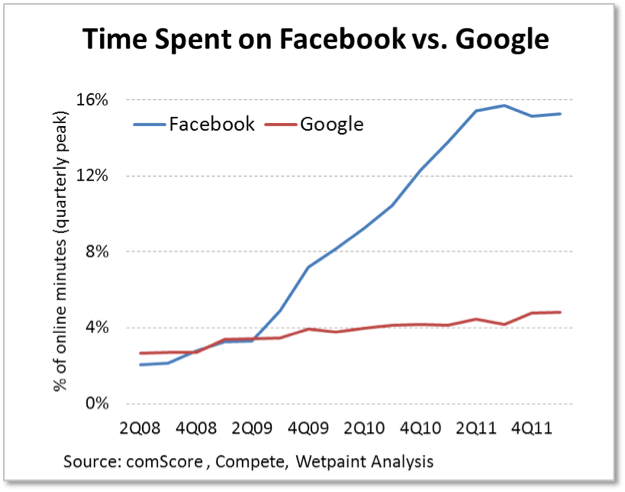 Facebook, like Google, isn’t always successful in all their ventures.